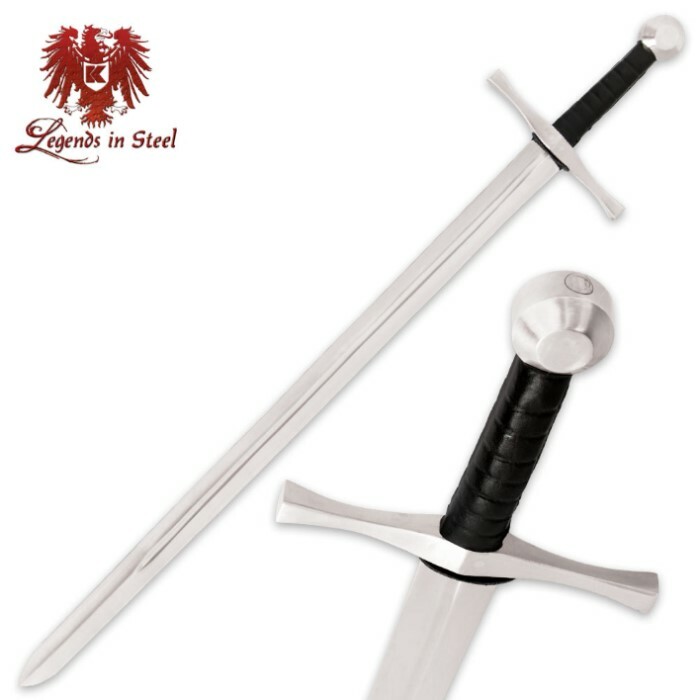 Legends In Steel Medieval Training Broadsword | BUDK.com - Knives & Swords At The Lowest Prices! Add this Legends In Steel Medieval Training Broadsword to your collection of trainers today. You will definitely be satisfied with its sturdy, no-nonsense construction. The 32” blade is made of high carbon steel and features a full-tang. The point of the blade is rounded for safety. The grip is of leather for a secure hold and the trainer is 40” in overall length. Its a hand and a half sword. Well its not a broad sword its a hand and a half sword so I was disappointed about that. Also it seems the guard is pinned on and has cosmetic blemishes, like the 2 visible pins. That being said it does seem very sturdy. I wanted a 1 handed broad sword but this hand and a half will have to do. It is worth the money but not at all what I expected. For 50 bucks, I figured it would be worth taking a chance on this sword, as any other medieval trainers cost at least double this price. After receiving it, I am glad that I did. It is solidly built, well tempered, has a decent balance point, and should hold up to the rigors of training for quite some time. Not only is the pommel peened, but the guard (and probably the handle scales) is pinned to the tang. Two things caused me to take away a star. First, it's too heavy. It's at least 2 pounds over weight. Second, the handle scales under the leather are not shaped well, and they are not flush with the tang. Regardless, this item is well worth the price, and I highly recommend it. This is a strong sword that is meant for sparring. I've been very happy with it so far. I just received this sword today, and I will say that it does have some weight to it. However, there are a few details that they didn't point out in the description. First, in the description photo, the blade appears somewhat rounded/pointed. The sword I received has a point that is more square/rounded, rather than rounded/pointed. And second, the blade arrived with knicks and scratches up and down the blade. And third, the peen on the pommel is not quite center, meaning that if I were to slam this blade against a rough surface, the tang would break. Overall, I give this sword a 4/5 for looks, but a 3/5 for functionality. This is the first full-tang, peened-pommel medieval sword I have ever owned, and for the price, I am very impressed. I looks as if the blade may not have been fully tempered and is a little blade-heavy, otherwise I would give it a 5/5. Nevertheless, this is the perfect first-time medieval training sword for me as I am getting into HEMA (Historical European Martial Arts), and will definitely look into this brand from Budk again. Good quality, fairly solid blade. Good buy for the price.